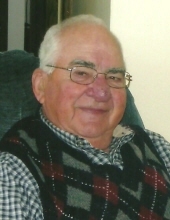 George J. Liegel age 87 of Plain passed away unexpectedly on Monday, April 8, 2019 at the Sauk Prairie Health Care Center. He was born on January 10, 1932 in Plain the son of George and Anne (Laubmeier) Liegel. George was married on October 16, 1951 to the former Marcie Pulvermacher. He was a lifelong member of St. Luke’s Catholic Church and loved to farm, fish and hunt. Survivors include, his wife Marcie Liegel, 6 sons, Reg, Randy (Linda), George (Mary Lynn), James (Cindy), Pat (Kelly), Steve (Susan), 14 grandchildren, 2 step grandchildren, 1 great granddaughter, a sister, Viola Paulus, a brother, Vern (Bernie), a sister-in-law, Dolores Liegel, many nieces, nephews, other relatives and friends. He was preceded in death by his parents, George and Anne Liegel, a daughter, Jean Marie Liegel, a daughter-in-law, Kathy Liegel, 6 brothers, Joseph, Ralph, Edward (Alma), Alfred (Berniece), Vic, Florian “Duffy”, 3 sisters, Alma (Ray) Brickl Sr., Florence (Allie) Alt, Marian (Al) Layton, and a brother-in-law, Ed Paulus. A Mass of Christian Burial will be held on Tuesday, April 16, 2019 at 11:00 A.M. at St. Luke’s Catholic Church in Plain. Fr. John Silva will officiate with burial in the church cemetery. Visitation will be held on Monday, April 15, 2019 from 4:00 P.M.-7:00 P.M. and again on Tuesday at the church from 10:00 A.M. until the time of Mass at 11:00 A.M. In lieu of flowers memorials may be made to St. Luke’s Catholic Church. Online condolences available at www.staffordfuneralhomes.com. The Richardson-Stafford Funeral Home in Spring Green is assisting the family with the arrangements. "Email Address" would like to share the life celebration of George J. Liegel. Click on the "link" to go to share a favorite memory or leave a condolence message for the family.